The Oestridae are a family of flies variously known as bot flies, warble flies, heel flies, gadflies, and similar names. Their larvae are internal parasites of mammals, some species growing in the host's flesh and others within the gut. The human botfly, Dermatobia hominis, is the only species of bot fly known to parasitize humans routinely, though other species of flies do cause myiasis in humans. 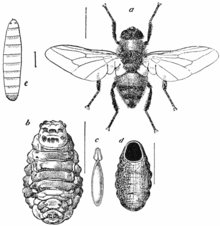 A botfly, also written bot fly, bott fly or bot-fly in various combinations, is any fly in the family Oestridae. Their lifecycles vary greatly according to species, but the larvae of all species are internal parasites of mammals. Largely according to species, they also are known variously as warble flies, heel flies, and gadflies. The larvae of some species grow in the flesh of their hosts, while others grow within the hosts' alimentary tracts. The word "bot" in this sense means a maggot. A warble is a skin lump or callus such as might be caused by an ill-fitting harness, or by the presence of a warble fly maggot under the skin. The human botfly, Dermatobia hominis, is the only species of bot flies whose larvae ordinarily parasitise humans, though flies in some other families episodically cause human myiasis, and are sometimes more harmful. The Oestridae now are generally defined as including the former families Oestridae, Cuterebridae, Gasterophilidae, and Hypodermatidae as subfamilies. The Oestridae, in turn, are a family within the superfamily Oestroidea, together with the families Calliphoridae, Rhinophoridae, Sarcophagidae, and Tachinidae. Of families of flies causing myiasis, the Oestridae include the highest proportion of species whose larvae live as obligate parasites within the bodies of mammals. Roughly 150 species are known worldwide. Most other species of flies implicated in myiasis are members of related families, such as blowflies and screwworm flies in the Calliphoridae. 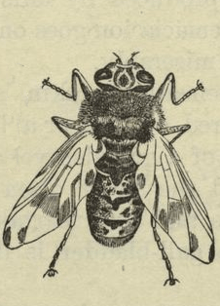 Botflies deposit eggs on a host, or sometimes use an intermediate vector such as the common housefly, mosquitoes, and, in the case of Dermatobia hominis, a species of tick. They are common in Belize. The smaller fly is firmly held by the botfly female and rotated to a position where the botfly attaches some 30 eggs to the body under the wings. Larvae from these eggs, stimulated by the warmth and proximity of a large mammal host, drop onto its skin and burrow underneath. Intermediate vectors are often used since a number of animal hosts recognise the approach of a botfly and flee. Myiasis can be caused by larvae burrowing into the skin (or tissue lining) of the host animal. Mature larvae drop from the host and complete the pupal stage in soil. They do not kill the host animal, thus are true parasites. The equine botfly presents seasonal difficulties to equestrian caretakers, as it lays eggs on the insides of horses' front legs, on the cannon bone and knees, and sometimes on the throat or nose, depending on the species. These eggs, which look like small, yellow drops of paint, must be carefully removed during the laying season (late summer and early fall) to prevent infestation in the horse. 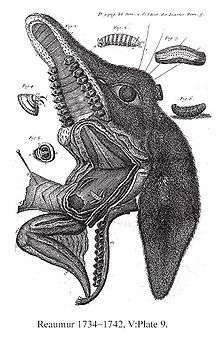 When a horse rubs its nose on its legs, the eggs are transferred to the mouth, and from there to the intestines, where the larvae grow and attach themselves to the stomach lining or the small intestine. The attachment of the larvae to the tissue produces a mild irritation which results in erosions and ulcerations at this site. Removal of the eggs (which adhere to the host's hair) is difficult, since the bone and tendons are directly under the skin on the cannon bones: eggs must be removed with a sharp knife (often a razor blade) or rough sand paper, and caught before they reach the ground. The larvae remain attached and develop for 10–12 months before they are passed out in the feces. Occasionally, horse owners report seeing the botfly larvae in horse manure. These larvae are cylindrical in shape and are reddish orange in color. In one to two months, adult botflies emerge from the developing larvae and the cycle repeats. Bots can be controlled with several types of dewormers, including dichlorvos, ivermectin, and trichlorfon. In cattle, the lesions caused by these flies can become infected by Mannheimia granulomatis, a bacterium that causes lechiguana, characterized by rapid-growing, hard lumps beneath the skin of the animal. Without antibiotics, an affected animal will die within three to 11 months. 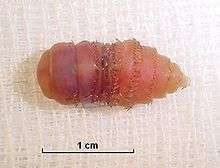 The human botfly occasionally uses humans to host its larvae. The larva, because of its spines, can pose an extremely painful subepidermal condition. The fastest way to remove a botfly is by putting a generous amount of iodine in the hole. The botfly will react instantly by poking out of the hole. Seemingly unknown by the medical field. Another removal method is to use the tree sap of the matatorsalo, found in Costa Rica, which is reputed to kill the larva, yet leave its body in the skin. Additionally, one can attempt to seal the breathing hole of the larva with nail polish or petroleum jelly; after a day, with a clinical professional, the breathing hole is enlarged and the larva is removed with forceps. Squeezing the larvae out is not recommended, as it can cause the larvae to rupture; their bodily fluids have been known to cause severe anaphylactic shock. Use of adhesive tape can work, but carries additional risk of infection because portions of the larva's breathing tube can be broken off by the tape and make the remainder of the body difficult to remove. In cold climates supporting reindeer or caribou-reliant populations, large quantities of Hypoderma tarandi (caribou warble fly) maggots are available to human populations during the butchery of animals. The sixth episode of season one of the television series Beyond Survival entitled "The Inuit - Survivors of the Future" features survival expert Les Stroud and two Inuit guides hunting caribou on the northern coast of Baffin Island near Pond Inlet, Nunavut, Canada. Upon skinning and butchering of one of the animals, numerous larvae (presumably Hypoderma tarandi, although not explicitly stated) are apparent on the inside of the caribou pelt. Stroud and his two Inuit guides eat (albeit somewhat reluctantly) one larva each, with Stroud commenting that the larva "tastes like milk" and was historically commonly consumed by the Inuit people. Copious art dating back to the Pleistocene in Europe confirms their consumption in premodern times, as well. ↑ Inc. Merriam-Webster (2011). Webster's American English dictionary. Springfield, MA: Federal Street Press. ISBN 978-1-59695-114-3. ↑ Mullen, Gary; Durden, Lance, eds. (2009). Medical and veterinary entomology. Amsterdam, NL: Academic. ISBN 978-0-12-372500-4. 1 2 Brown, Lesley (1993). The New shorter Oxford English dictionary on historical principles. Oxford [Eng. ]: Clarendon. ISBN 0-19-861271-0. ↑ Pape, Thomas (April 2001). "Phylogeny of Oestridae (Insecta: Diptera)". Systematic Entomology. 26 (2): 133–171. doi:10.1046/j.1365-3113.2001.00143.x. ↑ Dunleavy, Stephen (producer) (2005-10-20). Life In The Undergrowth: Intimate Relations (Programme synopses). BBC. Retrieved 2008-12-17. ↑ Drees, B.M. ; Jackman, John (1999). "Horse Bot Fly". Field Guide to Texas Insects. Houston, Texas: Gulf Publishing Company. Retrieved 12 June 2013. 1 2 Ondrak, Julie. "Ask The Vet: Treating Bot Infestations In Horses". lambriarvet.com. Retrieved 2009-09-10. ↑ Piper, Ross (2007). "Human Botfly". Extraordinary Animals: An Encyclopedia of Curious and Unusual Animals. Westport, Connecticut: Greenwood Publishing Group. pp. 192–194. ISBN 0-313-33922-8. OCLC 191846476. Retrieved 2009-02-13. ↑ Riet-Correa, F.; S. L. Ladeira; G. B. Andrade; G. R. Carter (December 2000). "Lechiguana (focal proliferative fibrogranulomatous panniculitis) in cattle". Veterinary Research Communications. 24 (8): 557–572. doi:10.1023/A:1006444019819. PMID 11305747. ↑ Pariser, Harry S (2006). Explore Costa Rica. Manatee Press. ISBN 1-893643-55-7. ↑ Archived July 28, 2013, at the Wayback Machine. ↑ Felt, E.P. (1918). "Caribou warble grubs edible". Journal of Economic Entomology. 11: 482. ↑ "Les Stroud Beyond Survival: The Inuit - Survivors of the Future". Lesstroud.ca. Archived from the original on 2016-03-02. Retrieved 2015-11-10. ↑ Guthrie, Russell Dale (2005). The Nature of Paleolithic Art. University of Chicago Press. pp. 6–. ISBN 978-0-226-31126-5. Retrieved 7 May 2013. Wikimedia Commons has media related to Oestridae.